Come London Fashion Week, rolling-rack gridlock, wrinkled garments, and last-minute fitting woes will be the least of Emily Crane’s problems. 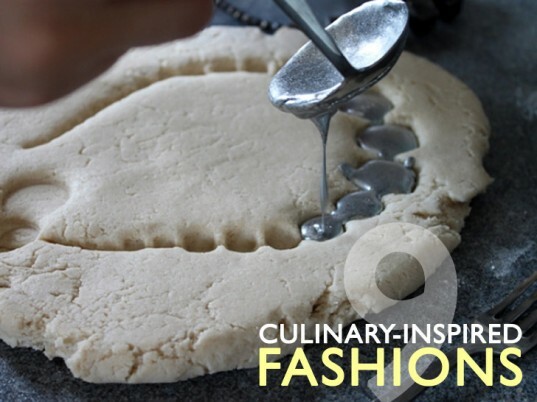 Because the Kingston University fashion student is pioneering a new strain of edible couture, she’s more likely to fuss over temperature dials and vats of colored gelatin than wrestle with pins and garment tape. Even Crane’s choice of mentor is less than orthodox: Instead of rapping on the doors of London’s couture houses, she’s been holding tête-à-têtes with the chefs at The Fat Duck, the three-Michelin-starred restaurant owned by avant-garde food scientist Heston Blumenthal. Suzanne Lee can conjure clothing out of thin air. No, wait, that’s not entirely accurate. She’ll need at least a couple of bathtubs, some yeast, a pinch of bacteria, and several cups of sweetened green tea. Lee, who is a senior research fellow at the School of Fashion & Textiles at Central Saint Martins in London, is the brains (and brawn) behind BioCouture, an experiment in growing garments from the same microbes that ferment the tasty caffeinated beverage. 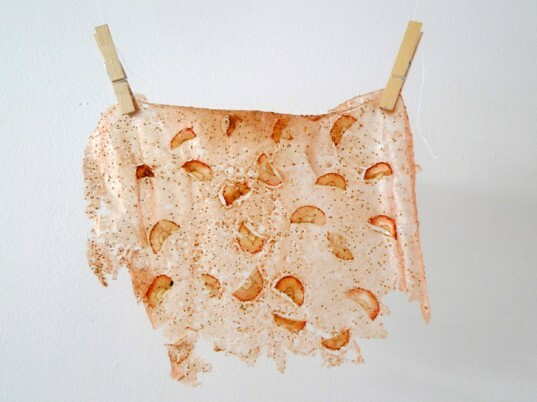 It’s from this microbial soup that fibers begin to sprout and propagate, eventually resulting in thin, wet sheets of bacterial cellulose that can be molded to a dress form. As the sheets dry out, overlapping edges “felt” together to become fused seams. When all moisture has evaporated, the fibers develop a tight-knit, papyrus-like surface that can be bleached or stained with fruit and vegetable dyes such as turmeric, indigo, and beetroot. With the planet’s landfills groaning under the weight of our unchecked consumption, the ability to leave no trace behind has become a design selling point. 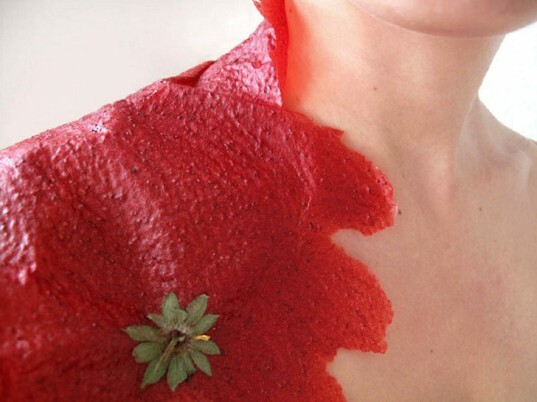 Young Ju Do, a fashion student at Central Saint Martins in London, devised a series of “compostable accessories” derived from edible, biologically nutritive organic materials. Returned to the soil, the erstwhile jewelry becomes chow for microorganisms, allowing it to cycle back into the food chain. Unlike other biodegradable products on the market, Young’s designs don’t require an industrial composting facility. “The cradle-to-cradle cycle is very important for [the future of textiles],” she says. “This will create a new kind of throwaway culture and a new value for short-term use.” Yummy. By exploring the cellular programming of morphogenesis in plant systems, Carole Collet’s speculative “Biolace” project imagines hybrid plants capable of not only bearing fruit but also producing lace samples from their intertwined roots. 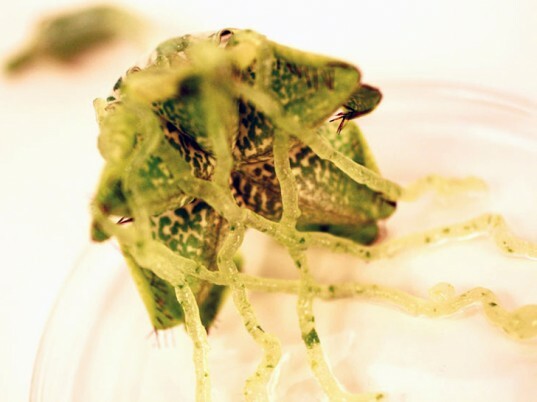 “This post-2050 scenario considers a radical way to combine food production with textile production, thus designing plants that could replace textile machinery but also provide nutrients,” Collet says. incredible post. love the fruits and veggies fabric concept. yum yum - gummy garments! The transient consumables photo looks like she is wearing a fruit roll up. 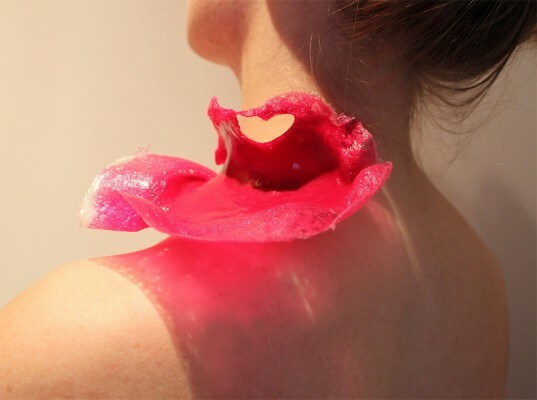 Won't that get sticky and gross on the skin? It would sure come in handy when you need a snack! I love the compostable accessories! Don't even attempt to get the red wine out of this dress. The skintight garment is part of a line of "fermented fashion" derived entirely from the alcoholic beverage. Developed by a group of scientists at the University of Western Australia, the Microb'be' project eschews "lifeless weaving machines" in favor of living microbes, according to Gary Cass, its lead researcher. 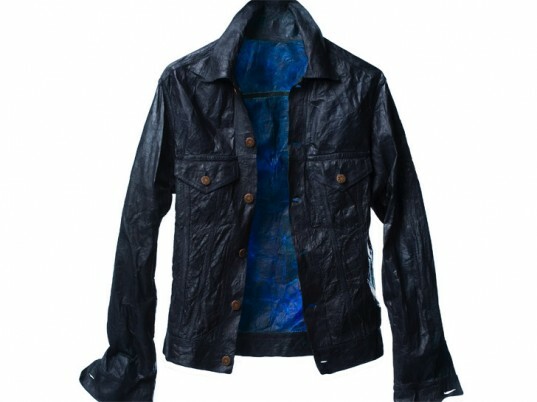 The resulting material, which comprises microfibers of cellulose, feels like sludge when wet but dries to the consistency of cotton. Just one catch: Acetobacter produces vinegar as its end product, which makes the garment smell like "the morning after the night before," Cass tells Ecouterre. "As the Micro'be' garments are more environmentally friendly than genetically engineered cotton plants, the wearer must consider how much smell they are willing to withstand to save the planet!" The brainchild of German designer Anke Domaske, Qmilk is the trademarked name for a form of milk fiber, a silky textile derived from an odorless protein found in mammalian milk. Domaske extracts casein only from soured "secondary milk" that's no longer for human consumption and headed for disposable. Unlike comparable milk-based fibers, Qmilk makes efficient use of water (2 liters for every kilogram of fabric), requires no harmful chemicals, and leaves behind zero waste. Suzanne Lee can conjure clothing out of thin air. No, wait, that’s not entirely accurate. She’ll need at least a couple of bathtubs, some yeast, a pinch of bacteria, and several cups of sweetened green tea. Lee, who is a senior research fellow at the School of Fashion & Textiles at Central Saint Martins in London, is the brains (and brawn) behind BioCouture, an experiment in growing garments from the same microbes that ferment the tasty caffeinated beverage. It's from this microbial soup that fibers begin to sprout and propagate, eventually resulting in thin, wet sheets of bacterial cellulose that can be molded to a dress form. As the sheets dry out, overlapping edges “felt” together to become fused seams. When all moisture has evaporated, the fibers develop a tight-knit, papyrus-like surface that can be bleached or stained with fruit and vegetable dyes such as turmeric, indigo, and beetroot. By exploring the cellular programming of morphogenesis in plant systems, Carole Collet's speculative "Biolace" project imagines hybrid plants capable of not only bearing fruit but also producing lace samples from their intertwined roots. "This post-2050 scenario considers a radical way to combine food production with textile production, thus designing plants that could replace textile machinery but also provide nutrients," Collet says. 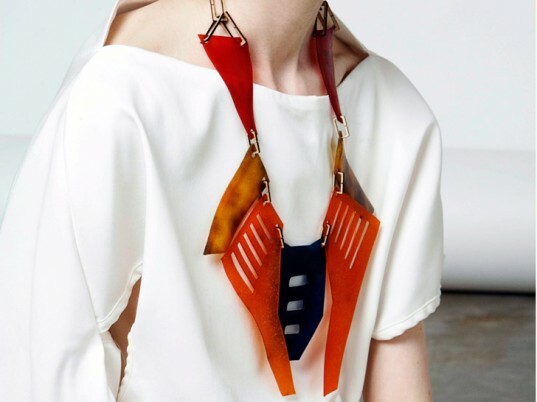 Few things are more ephemeral than fashion trends, which Diana Kovacheva describes as "manufactured demands" that push consumers to constantly seek out newer, more attractive products. The textile designer, who graduated from London's Central Saint Martins, imagined a future where clothes had a "Best Before" date. "You are what you eat and you are what you wear, it’s all about taste," she quips. "How would seasonal trends be defined in this imaginable fashion world?"